Unity Works was a community project. 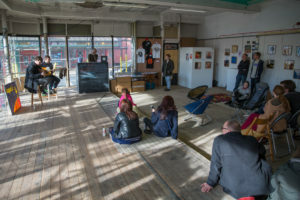 Having lain empty for a decade, in 2012 a funding appeal was put out for local residents to contribute small amounts for a feasibility study, acquiring the lease and refitting it out as a live venue and office space. My family visited the building when it was still largely derelict (my children being fascinated by the dead pigeons and 1940s office decor). It was a massive undertaking – we became shareholders with a single share, the most we could afford at the time. Posters were printed, exhibitions were organised, fundraising concerts took place – there was even a book. Community grants, loans and match-funding were ploughed into it – with the Arts Council funding conspicuous by its absence (the chap who handled the bid has spoken publicly about why this was, but I will not reiterate his comments here). Ultimately however, the fundraising was successful. No mean feat, really. I was absent the day the keys were handed over to the shareholders and the resulting press photo (personal issues getting in the way at the time) but frequently my children and I would walk past the building and wonder how it was all going, seeing the scaffold going up, beautiful parts of the building unveiled and the old Co-Operative signage revealed for the first time in decades, almost-daily photographs by local photographer John Jowett gracing social media to keep us updated. There were regular newsletters, the AGMs and meetings, and planned tours of the works. An additional funding appeal was made to open a café on the corner, to which I contributed so I could gift my children their own share each. My name on the community shareholders artwork – still in-situ. Eventually it opened with a grand fanfare, the great and the good of the City in attendance. The Council Leader made An Important Speech. We wore our best frocks and tuckers. Ossett Brewery put out a celebratory “Dead Pigeon” ale. There were promises of small sub-groups such as Unity Arts, Friends Of Unity Works and how shareholders would be able to buy tickets that little bit cheaper. My children and I wandered the building on opening night trying to work out which bit might be “ours”, eventually settling on a bit of flooring in the Minor Hall. 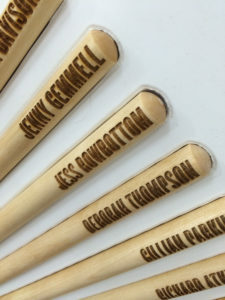 There was my name on a piece of artwork, as an early (if tiny) investor. We were a very proud family – we owned a bit of that, we were involved! Over the next few years (as circumstances permitted) I saw some brilliant gigs there: Kate Rusby, Embrace, Fat White Family, The Lovely Eggs, Ash to name but a few. Long Division Festival 2014 called it home with local superstar rockers The Cribs. Saint Etienne was my first gig after coming out of hospital. Events such as Wakefield Comic-Con with my family, various record fairs, the live recordings of local groups The Ainsley Band and Piskie Sits. The final gig I saw there before the administration was Tom Robinson performing the whole of Power In The Darkness, in a packed Minor Hall. I performed on stage as well – the launch gig for my debut album took place in the Minor Hall, and only three weeks ago I stood in the Unity Works Cafe Bar at 10am performing with Ralph for Wakefield Lit-Fest. 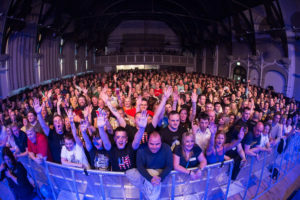 When we needed a venue to film a video for a prospective Eurovision Song Contest entry, we were allowed to use the stage and lighting for an evening thanks to their relationship with stagecraft school Backstage Academy – heck, we even named the band “Unity”. So there are lots of lovely, lovely memories. But it was always a bit hit-and-miss – the New Years Eve parties we went to were a bit haphazard (even almost forgetting the New Year countdown in 2015), the prices which gradually got higher, the shareholder discount disappeared, co-working prices went up, the promised Friends Of Unity Works and Unity Arts groups were disbanded, the ever-present spectre of local music politics, and finally feeling it was only really a venue for touring bands rather than the promised “taking a chance on local bands”. It was a big building, a huge building and a pain in the arse to manage I’m sure, not to mention how much it’d cost to heat and run on a daily basis. Of the eight members of staff who have been “let go”, I personally know a couple of them and know they will have given it their all – tough questions will be at board level rather than the coalface, of business plans, profit-and-loss accounts, the fabled 2017 AGM which never seemed to happen, of overall direction and how the promised community work lost its way. It will also be a distressing time for a lot of people affected, not least the performers and promoters who found out via social media that their gigs had been cancelled, the brides and grooms whose wedding deposits will have been lost, the artists whose work is still trapped in the building, the community shareholders and volunteers whose goodwill brought the building alive, and of course what might happen to the listed Unity Works building itself now. It’s a beautiful structure with so many memories, nicely renovated and ready for someone else to pick up so I doubt this is really the end. Heck, you never know, it might even become what it was intended to be: a huge community-driven arts centre, but the chances of that in this economic climate are remote. As my lovely friend Tony said: “Don’t be sad the Unity Works is shut. Be happy it did what it did. Thank you all who made that possible. That is what is important.” I couldn’t have put it better myself. Thanks for that evocative piece. It brought back some very happy memories. I hope the hollow feeling, following the closing of Unity, is eventually filled. it would indeed be a crying shame for all the hard work to go to waste.